For military and intelligence communities, outer space has become a highground, hide-and-seek arena -- a kind of "now you see me, now you don't" espionage playing field. Over the decades, spying from space has always earned super-secret status. They are the black projects, fulfilling dark tasks and often bankrolled by blank check. However last month, several U.S. senators openly blew the whistle on a mystery spy satellite program, critical of its high cost while calling to question its utility in today's post-9/11 world. One lawmaker, Jay D. Rockefeller (D-WV), the vice chairman of the Senate intelligence committee, openly criticized the program on the floor of the U.S. Senate. He said the program "is totally unjustified and very wasteful and dangerous to national security," adding that he has voted to terminate the program for two years, with no success. There is now a delicate dance underway between issues of national security and open public scrutiny about taxpayer dollars being spent wisely or squandered. Meanwhile, the swirl of secrecy seems to be revolving around a top secret "stealthy" satellite project, codenamed MISTY. First, there's a little unclassified history. The U.S. stealth satellite program at issue was first spotlighted publicly by Jeffrey Richelson, a senior fellow of the National Security Archive in Washington, D.C. The Archive is gathering declassified U.S. documents obtained through the Freedom of Information Act. In doing so, the Archive declares they have become the world's largest non-governmental library of declassified documents. The MISTY effort was broached in Richelson's first-rate book on the Central Intelligence Agency (CIA), The Wizards of Langley: Inside the CIA's Directorate of Science and Technology, published in 2002 by Westview Press in Boulder, Colorado. Richelson described the launching of the stealth imaging satellite via space shuttle Atlantis in 1990. He noted that MISTY's objective was to lessen the threat to U.S. satellites from the Soviet Union -- a nation whose anti-satellite program was of "significant concern" to U.S. military space officials during the early 1980s, he wrote. But within weeks after MISTY's shuttle deployment, both U.S. and Soviet sources reported that the satellite malfunctioned. Richelson explained that a spacecraft explosion "may have been a tactic to deceive those monitoring the satellite or may have been the result of the jettisoning of operational debris." Whatever the case -- and to the chagrin of spysat operators -- a network of civilian space sleuths had been monitoring a set of MISTY maneuvers and the explosion, ostensibly part of a "disappearing act" meant to disguise its true whereabouts. Richelson has posted on the Internet declassified documents he has obtained that track the historical roots of the still active stealth satellite work, dating as far back as 1963. One document is U.S. Patent 5,345,238, issued to Teledyne Industries of Los Angeles, California in 1994. It details a movable "satellite signature suppression shield" -- a bit of clever technology that can suppress the laser, radar, visible, and infrared signatures of a satellite. The invention makes spotting or tracking a satellite a tough-to-do proposition. The camouflage space shield, as reviewed in the patent, takes on the form of an inflatable balloon. It can be quickly deployed and made rigid upon exposure to both outside and internally-created ultraviolet radiation. This shield can be tailored to a particular spacecraft and orbital situation. 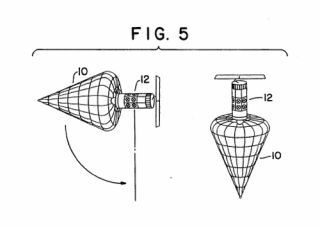 Once deployed, the cone-shaped balloon is oriented to deflect incoming laser and microwave radar energy, sending it off into outer space. While an intriguing bit of high-tech handiwork, whether or not this stealthy idea is an active ingredient of the MISTY satellite series is not publicly known. "We don't know exactly what technology was used for the first couple of MISTYs to try to ensure stealth," Richelson told SPACE.com, "so we don't know what's being proposed for this generation...what difference there is, if any." Richelson said that new systems and new technologies could experience difficulties that can add up to more dollars. "The question is whether you think it's worth it to persevere...spending the extra money to get something worthwhile." The world has changed considerably since the MISTY program was first initiated, Richelson added. So too have changes in denial and deception practices, perhaps calling to question buying additional stealth satellites, he said, contrasted to purchasing more conventional spy satellites. Maybe you can attain the basic objectives in terms of uncovering what various countries are up to with other systems, and possibly for less cash, Richelson suggested. "But again, that's something that has to be assessed based on experience," Richelson said. "People should be able to make some assessment on a classified basis, at least as to what we're getting from this type of system that we wouldn't get from the more conventional systems, and whether that's worth the money." According to a SPACE.com source and an analyst familiar with American satellite reconnaissance, there are several kinds of stealth at work, not just in space, but on the ground too: bureaucratic stealth and operational stealth. "The United States started to use bureaucratic stealth when it first began the Corona reconnaissance program in the late 1950s. The very existence of the project was a secret and for several years the U.S. Air Force told the public that it was simply testing engineering equipment, not launching actual reconnaissance satellites," the source, who did not wish to be identified, noted. "Another form of bureaucratic stealth is to use a cover story, such as telling the world that you are launching a simple scientific satellite when in reality the satellite contains intelligence equipment." Starting around 1960, the CIA and the U.S. Air Force both began to look at ways of achieving operational stealth -- that is, actually hiding the satellites themselves. A number of ideas were fostered decades ago in U.S. military and intelligence circles centered on snagging cold war-class sneak peeks at an enemy using satellites. "Because Soviet satellite tracking systems were so primitive, they thought that the best way to achieve this was to perform a covert satellite launch. They considered various options, from launching the satellite from a submarine to carrying the rocket underneath or inside an aircraft like a C-130 and launching it over the ocean," the source noted. But these plans never went very far for a number of reasons. "For starters, they could not put a powerful enough camera inside a rocket small enough to be carried by an airplane. In addition, for a good part of the 1960s, the people looking at satellite photographs found no indications that the Soviets were actually trying to hide their activities," the source explained. "If the Russians had realized just how much American satellites could see, they would have taken more care to hide from them. For instance, the CIA was able to determine how strong Soviet intercontinental ballistic missile silos were because they could watch them under construction and determine the thickness of their walls." It appears that the first attempt to hide a satellite from radar and optical sensors occurred in the mid-1970s with an experimental military satellite. But it was not until the 1980s that this effort was dramatically increased. The Reagan administration poured a huge amount of money into satellite reconnaissance, including a stealth satellite program. They created a special security compartment called "Zirconic" that was extremely secret. "Only someone who had a 'Zirconic clearance' was allowed to know about the existence of the stealth satellite program. The specific technology was given the code name 'Nebula'", the analyst said. The National Reconnaissance Office (NRO) initiated a number of stealth satellite programs during the 1980s. The NRO manages the nation's spy satellite programs. The most notable of these was dubbed MISTY, a non-acronym but apparently a photoreconnaissance satellite for snapping pictures. "It was designed to be invisible to radar and optical tracking from the ground, but its photos were not as good as the big, non-stealthy reconnaissance satellites, like the Keyhole 11 and its successors. MISTY was launched from the space shuttle in 1990 in an unconventional way...it was rolled out over the side," the source recounted. Another stealthy satellite was launched in 1999 atop a Titan 4 rocket launched from California. Once again the amateur satellite trackers followed it, although after awhile they began to suspect that they were actually following a decoy and that the satellite itself was in a different orbit. It appears that American stealth satellites take on the look of a kind of 'magic bullet' within the intelligence arsenal. They are not as versatile as regular intelligence satellites. "So the stealth satellite is used to take pictures when the adversary thinks that there are no satellites overhead. Presumably there are only a few instances where this is useful -- after all, lots of activities and objects cannot be hidden," the source said. "And the technology is apparently extremely expensive." And that breathtaking price tag has helped spur the current controversy into the open -- whether or not oodles of money should be spent to achieve what some experts consider very little result. "It is also probably true that the recent spate of military space cost overruns has made everybody wary," the analyst continued. Among those climbing in price tag are the Space Based Infrared Satellite Systems project (SBIRS), the Advanced Extremely High Frequency communications satellite, along with a new class of reconnaissance satellites, both optical and radar, called the Future Imagery Architecture. "So the military space people have burned up all their credibility on Capitol Hill, using billion dollar bills as fuel," the source concluded. The current flap over MISTY "stems more from the Bush administration's obsession with secrecy and oppressing dissent regarding its programmatic, budgetary, policy choices," said Theresa Hitchens, Vice President of the Center for Defense Information in Washington, D.C.
"They do this by trying to intimidate those willing to speak out in public than about the satellite itself," she said. Are there are any lessons to be learned from the issue? If there are, Hitchens added, "it is that space programs are expensive, and it is important to carefully weigh the benefits of any program versus the costs...as well as against alternatives for accomplishing the same mission." "I think this episode suggests that secrecy is sometimes used not to protect national security, but to line someone's pockets," said Steven Aftergood, a senior research analyst at the Federation of American Scientists (FAS) in Washington, D.C. He directs the FAS Project on Government Secrecy which works to reduce the scope of government secrecy, to accelerate the declassification of cold war documents, and to promote reform of official secrecy practices. "Even though the Senate Intelligence Committee has twice concluded that the program is not justified on the merits, it remains fully funded," Aftergood told SPACE.com. The reason why, Aftergood explained, is because congressional appropriators are free to spend the money without being held accountable for their actions. "There is a certain inequity built into the multi-billion dollar intelligence appropriations process. Industry lobbyists holding security clearances are free to advocate for their preferred programs. But critics or skeptics are not even permitted to know what is at issue. So it is not surprising that there will be enormous boondoggles from time to time," Aftergood said. But given the "outing" of MISTY into the public forum, has national security been compromised? "I doubt it," Aftergood responded. "Other than its extravagant cost, very little concrete new information about the program has entered the public domain." If there is a policy lesson to be derived from all of this, Aftergood concluded, "I think it is that the integrity of the intelligence oversight process has to be strengthened. Among other things, that means reducing unnecessary budget secrecy, and curtailing industry advocacy on classified programs."